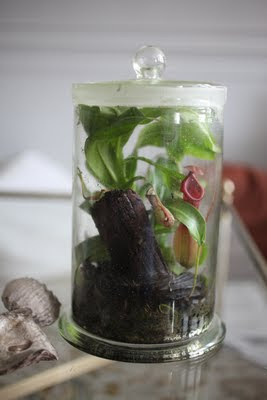 Can one grow a pitcher plant in a terrarium? I know I have been wondering this for a while after this post and then I happen to run into Stephen's beautiful nepenthe terrarium at whattheskieswerelike.blogspot.com. What a perfect pitcher plant terrarium and I love the proportions. He also has some very informative links and some great photos of these mysterious nepenthes. A Nepenthes is not a Sarracenia. I think they have different light requirements and growth habits. I've only seen Sarracenia in pots or in the ground, and I've only seen Nepenthes in hanging baskets. I've not seen either in the wild, but it seems the Sarracenia need full sun and the Nepenthes need to be under a tree. I have NO idea, but the Nepenthes is a different genus than the Sarracenia although they're both called pitcher plants. This whole carnivorous bog/high humidity plant thing has me very confused. I've heard Nepenthes are very temperamental, so going terrarium with them might be the trick. Who knew? Not me. I still want one though. That's a hella cool terrarium. Awesome find. I'm definitely going to follow "what were the skies like". Sarracenia are native to north america, and live in bogs. they range from full sun to shade, and go dormant in the winter. Nepenthes are mostly active year round and are native to SE asia. they live in jungles, with high humidity. CPs, with the exception of Cep. and sun pitchers are easy as a rule. use the "tray method" with distilled or RO water, and nepenthes are actually some of the most forgiving CPs out there. i have two massive ventricosas, a tobaica, a maxima, and multiple hybrids. all are houseplants. and they do wonders on fly problems!